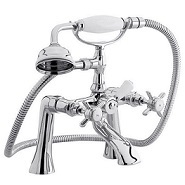 If your thinking of having a shower fitted, idealy before going out and purchasing a unit it would be a good idea to get advice from a plumber in order to avoid choosing a shower which is unsuitable. If you need a shower fitted in a bathroom as a replacment to a unit which as now become faulty, replacing the unit with the same manufacture/model can be a lot less problematic than just purchasing the cheapest shower available. Customers that need a shower fitted should be aware of all options available before hiring a plumber to carry out an installation. Having two diffrent means of hot in a property can have its advantages, showers that run off the boiler can no longer produce hot if the boiler breaks down. Electric showers are not reliant on the boiler and will still produce hot water independently. The installation of an electric shower requires the combination of plumbing and electrics,this task should only be under taken by a competent person. When Replacing faulty electic showers, the new unit may need to remain identical in kw to the unit which as now become faulty, unless the installation cable is adequately sized to accommodate a more powerful unit. An experianced electrician can competently carry out this task. This is not advised to be done by a DIY person in order to cut costs. Electric showers require water pressure for them to operate correctly, pre installation checks are vital to insure that the system meets the manufacture specifications. There are electic showers on the market that operate at low pressure, and can be used in situations here there is a lack of pressure, fitting a pump can also be an alternitve. One of the most common enquiries that plumbers are asked is i need a shower fitted, if there is not already a shower in place this task then becomes a lot more difficult. One of the most cost effective ways of producing a shower without the installation of electric cables or pipework would be the mixer taps. The mixer tap is not only cost effective,easy space saving and comes in both contemporary and traditional styles. The mixer is adjusted via the hot and cold taps to suite temperture requirements. If you need a shower fitted which is cost effective,space saving less disruptive, then the mixer taps would be an obvious choice.